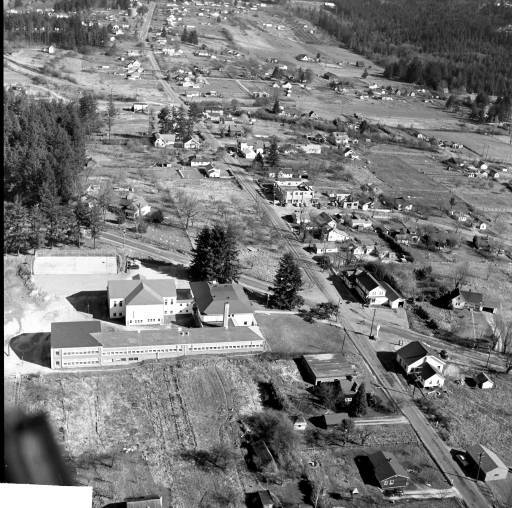 An aerial view of Garden Home, Oregon, in 1954. The photograph is facing east, and shows Oleson Road running horizontally and Garden Home Road running vertically. Garden Home School is the large, light building in the foreground with the old original school building still attached in what is now the south parking lot. The Garden Home Feed and Seed building, east of the intersection, has no roof structure. The Community Church is east of the feed store, where 71st Avenue is now. The two-story store at the intersection, variously named Upchurch, Throckmortons or the "White Store," burned in 1956. A nut orchard lies northeast of the intersection where a Thriftway grocery store would be built in 1957. This photograph was shot with a Rolleiflex camera by local resident Otto Arndt on May 4, 1954. Arndt took numerous aerial photographs of the Garden Home area on flights he chartered out of the Bernard Airport in Beaverton, all of them flown by pilot Walt Rupert. This image was digitized from a 2 1/4" negative.